In this episode we’re looking at Audio production applications, commonly know as a Digital Audio Workstation in the audio production industry. We’ll look at the most common options out there to give you an idea of which one might suit you. For a bigger read on this, check out our Podcast editing software article too. Audacity is a free open source digital audio editor and recording computer software application, available for Windows, Mac OS X, Linux and other operating systems. Audacity, even though it’s free, has a huge range of effects built in, such as compression, noise reduction, equalization, fade outs, amplifiers and a lot more. GarageBand is Apple’s standard DAW, designed for hobby podcasting and music creation. Garageband is free and has some really nice templates for podcasters, so it can give you an idea of how to setup a podcasting project within it. This powerful sound editing app is designed to accelerate audio and video production workflows and deliver the highest standards for audio quality. It is probably the most popular, most accessible and most commonly used paid digital audio work station in podcasting. There is a few different meet-ups going around the country and we’re going to hold one up here in Dundee, Scotland at the end of October. If you want to find out more about podcasting meet-ups associated with the UK Podcasters group, please visit the link above. Check out my youtube channel if you’re looking for a range of Audacity tutorials. Outsource-Typing provides top-quality support and is a reliable, affordable back-up plan during busy times, sickness/holidays, or simply when you want an experienced assistant to complete your typing, transcription and admin tasks. Fiona Frame provides transcription for this podcast. Mike runs Audio Production Masters, a website that provides a whole ton of video tutorials, particularly on Adobe Audition. Please drop me a comment below to let me know what you think and to ask any further questions about Audio Editing Softwares. If you are using one of the Digital Audio Workstation that I mentioned, let me know which one you use to edit your podcast and why you like it. Tell me what you do on your podcast, I’d love to hear about it. Finally, if you could leave me a review on iTunes I’d be so grateful – it really helps to get my podcast out there to more people. Thanks again for listening and I’ll see you on the next episode! The image used in this podcast is by PaulSh. My name’s Colin Gray and this is Podcraft, where we’re honing the art of podcasting. Today, we’re talking about digital audio workstations; this is what you use to edit your audio podcast. Let’s see what’s available. Welcome to another episode of Podcraft. Thanks for joining me again, as usual. This time we’re going to talk about software, so we’re getting into the technicalities of editing your podcast. This is the packages you can use to actually record your audio directly, to edit it, do post production, that type of stuff, everything you need to do to clean up your audio and get it ready to be put out into the outside world so that your listeners can actually listen to it. I’m not going to go through every single digital audio workstation out there, we’re just going to go through the ones that are most commonly used by podcasters, including a couple of free options and maybe one paid one. But we’ll cover everything, pros and cons, between them all so you can get a good chance to see which one you think might suit you. So we’ll get onto that in just a minute. Just before that, a couple of introductions. As usual, we’re supported here on Podcraft by Fiona Frame with transcription. So you can find Fiona’s services over at outsource-typing.com. She provides the transcriptions for this podcast and if you’re looking for a similar type of thing for your podcast, by all means check her out at that web address I’ve just mentioned. Next of all, I just wanted to mention before getting into the content, National Podcasting Day. So I’m not sure if you’ve heard about this. But if you’re listening to this podcast, no doubt you are a podcast producer, or you’re at least interested in the world of podcasting. Therefore, National Podcasting Day should be on your radar. Really, the idea of National Podcasting Day is to get the idea of podcasting out to more people. As you probably know, even if you’re producing podcasts, you know a lot about podcasting, but it’s still a pretty niche topic. There’s still plenty of people out there that don’t really know what a podcast is. And, really, obviously, we think they’re missing out on a lot! So the idea is to get the concept out to more people, to get more people listening to podcasts in general. And also to get more people making podcasts; to get people interested in the fact they can do it themselves. So National Podcasting Day aims to do all of that. There’s a couple of things I’m doing around this. I’m going to put the Podcasting Day logos on the website, so you can see it there, advertising just the fact it exists. I’m also organising a podcasting meet-up at the moment. It’s associated with the UK Podcasters Group, so UK Podcasters on Facebook. And there’s a few different meet-ups going on around the country and we’re going to hold one up here in Scotland, particularly in Dundee. It’s going to be in Dundee at the end of October and if you want to find out a bit more about that, then you can go to www.meetup.com/ukpodcasters and you’ll see all of the national meet-ups around the country. Obviously, I’d love you to come along to the Dundee one, that’s the one I’m organising, but there’s plenty around the country if this isn’t close enough for you. Obviously, I realise we are way up in the north, but if you are a Scottish podcaster, or at least close enough to make it, it would be great to see you there. Drop us a line in the comments on the episode here, which you can find at thepodcasthost.com/podcraft/205 and you can let us know if you’re going to come along. But it would be great to see you there at the event. So that’s one of the things I’m going for National Podcasting Day. The other thing is what everyone can do, and something I’m contributing to, is post a picture of your studio. It’s one of the things they’re asking for us to do, just to get the word of podcasting out there. So take a picture of your studio, take a picture of what it is you use to record your podcast and post it out on Facebook or Twitter, whatever you use, with the hashtag: Podcast Day, and we can all have a look at the kit that we use. If you’re into podcasting, tends to be you’re a little bit of a, well, most of you will be a kit geek like me so it’s good to see what kind of other stuff, what equipment people are recording on. So, by all means, take a photo of what you’re using, Tweet it out on #podcastday. Okay, so that’s enough of the introductions, let’s get into the content. Let’s look at digital audio workstations. So what I’m going to do is I’m going to go through three of the most popular digital audio workstations, commonly known as audio editing software. What I’m going to go through is Audacity, GarageBand and Adobe Audition. Now, I’ve always used Audacity, so I’ll go through that one first. Let’s look at the advantages of Audacity. Now, first off, Audacity’s free, so no cost. You can get hold of Audacity just by downloading it from the web. So that could be seen of one of the biggest advantages. But, obviously, no matter how free something is, it doesn’t matter; it’s not worth even free if it’s a bit rubbish. So let’s look at what it can actually do. 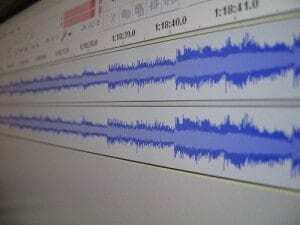 Now, Audacity, while it is free, is a hugely powerful package. One of the biggest advantages of Audacity – particularly over GarageBand, probably its main competitor – is the fact that it’s got a huge range of effects. So it’s got all sorts of things that you might need. The most common ones that podcasters will tend to use are things like compression, noise reduction, possibly a bit of equalisation and amplify as well, so you can standardise out your audio. Now, you can do all of those on Audacity, along with a range of other ones, like fade-outs and a few other things. So, Audacity does have a huge range of effects all built into it and most of them are good quality, with plenty of customisation available there as well. Essentially, it’s about as powerful as any amateur podcaster will need, and even a lot of professional audio producers as well, so it’s really powerful in that sense. Next thing is, Audacity is totally cross-platform, so you can use it on PC or Mac, which is really useful if you do work across different platforms, so you don’t want to have to learn two different things to use it on different computers. GarageBand, for example, is Mac only, so if you do learn GarageBand then you move over to a PC, you’re going to have to learn something new. So that is a definite advantage of Audacity. I would say Audacity, another pro for it, is the fact that there’s quite a lot of tutorials around, so it’s easy to learn. Now, it does look quite intimidating at first. I’ve taught Audacity in face-to-face classes quite a lot, as well as online, and people do get quite intimidated by it. The interface doesn’t look the most friendly – loads of knobs, loads of buttons. If you’ve not done any audio editing or video editing, that type of stuff before, the multi-track interface and the way the audio wave appears can look quite intimidating at first. But, once you get over that, once you start to learn it, it is really easy to learn. It is quite quick. Most of the stuff you will need is really easy to access and really easy to use as well. And I would say the range of tutorials out there are really powerful, they really get you through that initial learning curve. I’ve actually created a range of tutorials myself, so if you’re looking for a decent range to go through then, by all means, check out my YouTube channel, which is youtube.com/colinmcgray and you’ll find a range of Audacity tutorials there, taking you up from up from the total beginner steps to some of the more powerful tools in it, too. Now, talking about a not so good aspect of Audacity, a lot of people complain about the MP3 encoder in Audacity. Essentially, it’s an add-on that’s called Lame. You download it and you add it into Audacity so Audacity can export MP3s. Now, it’s known not to be the best quality in the world. It’s quite good for variable bit rate encoding, which is used often for music. But, for us podcasters, we tend to use constant bit rate encoding and it’s not so good for that. So you can do a lot better, which I’ll talk about a little bit later. But just to be aware. A lot of people advocate exporting a WAV from Audacity, which is the really high quality audio format, and then converting it to an MP3 in iTunes, for example, because iTunes has a really good quality MP3 encoder. So just to be aware, Audacity doesn’t have a good built-in MP3 encoder. And, also, it’s known to be a little bit flaky. So, on the downside, when you’re working with Audacity it can pause, it can be unresponsive a little bit. It doesn’t crash often for me, but it has happened. So just to be aware of that. While it’s a free application, and there’s a really good team behind it, but possibly it won’t be as robust as some of the more professional ones, such as GarageBand or Audition, which is the other one I’m going to talk about. A final pro for Audacity that I just want to go through is the fact that you can do chains within it. So once you get a bit more advanced, once you know what you’re doing, you’re doing the same processes each time, then you can set up automation for some of those processes. To give you an example, what I normally do for my podcast is that I will apply a bit of compression, I’ll apply a bit of amplification and a bit of equalisation as well. Now, I’ve experimented over the years to figure out the best compression, the best equalisation that suits my voice, so I know the settings that I use on Audacity. And, in the early days, what you have to do is actually select the whole track and, basically, run those effects, put in the settings that you use each time and then run it. And it can be a little bit cumbersome, but it is possible within Audacity to set up a chain, which essentially means that you can set up the settings for each of those processes and then just click one button to run that chain and it does all of it at once with those pre-set settings. So I just have to click once these days and it runs my standard compression settings, my standard amplification and my standard equalisation, all three of them all at once and gets it all done very quickly. So I do like that about Audacity; it does have a bit of workflow stuff in there to make things a bit easier for you, make things a bit more efficient. That’s what I would say about Audacity. That covers pretty much the standard Audacity pros and cons. So let’s more move on to its main competitor at that level, which is GarageBand. Now, again, GarageBand is free, so doesn’t cost anything to get. Now, full disclosure before I go through this, I don’t use GarageBand at all. I don’t have a Mac, never have been a Mac person. So really what I’m working on here is a bit of research and chatting to people that have used it a lot. So I do know a fair bit about it just through talking to people about it, and this is basically what I’ve found. Now, the first thing that people always talk about is the fact that it’s very easy to use. I mean, it is Apple that’s created it, after all. Apple are known for their ease of use, making stuff just basically simple as anything, really nice interface, great usability. So it’s very easy to get into podcasting with GarageBand. Because it’s Apple, and because Apple are one of the main instigators of podcast through iTunes, it does have some really nice templates in there for podcasters. So it can give you an idea of how to set up a podcasting project within GarageBand and it can help you do the standard stuff, the standard processes that you need to do as a podcast producer. There’s also, because of that, Apple provide quite a lot of loops and sound effects. So there’s quite a lot of music in there that you can use for free – royalty-free music – some sound effects as well, and plenty of loops so that you can have nice music beds, some stuff at the start of your podcast, like some theme music that then goes into the background and you can talk over it for a little while. And I hear that GarageBand is really good for setting up those loops and letting a loop run for a certain amount of time and then fading it out. So, apparently, it’s very easy for that type of stuff, bringing in that music and processing it alongside your vocals. So that’s a really nice little advantage, actually, because Audacity doesn’t make that quite so simple; you’ve got to get used to bringing in music, getting used to using the audio envelope, the volume envelope tool to make sure it fades out in the right place. Running loops, you have to make sure you copy it, duplicate it, put them right next to each other, that type of stuff. So GarageBand makes it a bit easier to run that type of process, getting your music set up. And also just the fact that it actually provides those for free is pretty handy. The only downside of that, of course, is that, because they’re free, because they’re in one of the most commonly used podcasting packages, which is GarageBand, they’re used a lot, so you probably will recognise quite a few of them if you listen to a lot of podcast. You will have heard them around the podosphere in the past; there’ll be a few podcasts using these. So to the big disadvantage of GarageBand and that’s the fact that it doesn’t have a huge amount of processing features. It’s not great for noise reduction, compression, that type of stuff. It has got some features along those lines but, really, for deeper audio processing, you want to be using something like Audacity, or Audition, which is the one I’m going to talk about next. It doesn’t offer you a huge amount of the more professional audio editing effects and processes. But, then again, a lot of people don’t really need those kind of things. I mean, there’s movement at the moment towards going back towards more natural-sounding voices, so less compression, less processed. And I do think that’s quite a good thing, because there are a lot more of really over-processed podcasts out there. So it could be that you don’t need any of that stuff and, actually, it just extends your workflow, doesn’t really provide that much benefit. I’ve also been told that, in GarageBand, you can only do it on certain sections of the track, so the effects that you can put in, you can only do it… sorry, to full tracks, you can’t do it to sections of the track. So, for example, in Audacity, I can choose a little bit of my track and I can amplify that a certain amount, or I can choose a little part of my track and compress that a certain amount. But, apparently in GarageBand, you can only select a whole track and process that whole thing at once, which seems pretty crazy, to be honest, but that’s what I’ve been told. By all means, if that is not correct; if you’re a keen GarageBand user and you know that that’s not true then stick a comment in the comments on today’s podcast notes and I’ll correct that in an upcoming podcast. Because it does seem a bit strange to me; I did look around for a bit for that, but I didn’t find anything to contradict that claim. Lastly, the thing about GarageBand is that it doesn’t actually output MP3s, which seems a bit strange! But probably partly because it’s part of the iLife family, which means that it integrates with iTunes. So what you do is you output your AIFF, which is a really high-quality audio file, similar to WAV, and you put that in to iTunes and then iTunes will create your MP3 for you. So the bonus of that is that iTunes has a really good MP3 encoder, so you’ll get a really good quality MP3 out of iTunes. But then it is an extra step on top of the processing, so it’s something else to do in your workflow, which you don’t need to do on Audacity. On Audacity you can export the MP3 directly from Audacity – even if it is lower quality – whereas in GarageBand you have to take that extra step to put it into iTunes. Okay, so that’s about it for GarageBand. Now let’s move on to Audition. Adobe Audition is the first paid one that I’m going to talk about – the only paid one that I’m going to talk about. Basically because it’s probably the most popular and most commonly used paid digital audio workstation, in podcasting, certainly. There are a whole range of similar applications, audio editing packages out there used by audio engineers, audio professionals. But Audition is probably the most accessible one out there, certainly for podcasters, and it’s promoted by quite a few podcasters around the podosphere. So what do you get for this money? Once you pay for it, you do get a lot of extra features straight away. Essentially, when you first look at Audition you’ll see it’s just a different level of quality. The interface is much more polished, much nicer, more user-friendly – possibly not in GarageBand; GarageBand, of course, is a really professional package, produced by Apple, of course, so it’s going to look nice, designed well. But, in Audition, the interface is so well set out for audio editing, introducing all those much more powerful editing tools, but making them look nice, making them, sort of, just to hand. Usability is great so that everything is really easy to use. Of course, being a professional audio editing package, all of the features are there, so you get everything Audacity has and more, such as compression, the normalisation, all that kind of stuff. All of the effects, all of the processes that you can think of will be in Audition, so anything you want to do to process your audio is there. And one of the great things about Audition is they come with a lot of presets as well. There are quite a few. So say you’re applying compression for the first time, you have to experiment quite a bit with the compression settings to see what suits your voice. And also compression for vocals differs from compression for other instruments, or music, so Audacity isn’t just so much tailored to vocals. So you’re playing around with the compression settings, trying to find something that suits vocals, whereas Audition has presets that work for vocals, for instruments, for music, that type of stuff. So you can try the compression presets and it might save you a bit of time in finding something that works really well. Similar with the other features as well, like equalisation and the like. So those presets can be really useful and give you a good pointer if you’re just getting into using these types of audio production processes. Next, while Audacity does have noise reduction and it does work pretty well, Audition is on a different level. Audition is known for its audio clean-up powers, so you can get rid of all sorts of noise in Audition, you can get rid of clicks, you can get rid of regular noise, regular buzz in the background. You can get rid of things like seagulls in the background. You can get rid of regular clicks and buzzes and all that kind of stuff. So Audition is really known for being great at cleaning up audio. It’s partly the fact that it offers a few different ways of doing it. So it has the standard audio wave where you can cut out parts, you can have a look at it and see what’s there, but it’s also got a spectrum analysis type of view which basically shows you a colour map of the different frequencies that happen. So if there is a regular noise like a click, or a beep that’s going on in the background, it’s possible that you can find that, isolate that particular frequency and cut that out using the spectrum analysis. And doing something like that affects the rest of your audio a lot less because you’re being so specific with the frequency that you’re getting rid of. Suffice to say that one of the things you’re paying for in Audition is the fact that you can really tidy up audio very well with it. Next thing around is the fact that with Audition the navigation is so much easier and you can navigate your way around an audio file really well. In Audacity, obviously, you can scroll side-to-side, you can find certain bits of the sound wave, but it’s just so much quicker and easier in Audition. Zooming in and out, finding the right place, navigating between different tracks. Audition is just set up so well for navigating your way around. It just saves you time, frustration and all the rest when you’re trying to edit your file. All of these things come together to say that Audition is a better package. It’s easier to use, it’s more powerful, it’s better designed than Audacity or GarageBand, but obviously it costs a fair bit of money. You’ve either got to subscribe to the Adobe Creative Cloud, which is something like £500 odd a year, or you’ve got to buy it individually which is multiple hundreds or pounds or dollars. It changes, so I’m not going to say the exact price at the moment, but it costs you a fair bit anyway. It will save you time, though. It will give you a lot more power. So it’s up to you whether you’re going to actually use these effects enough, whether you’re going to save enough time to justify that money; depends on how much your time is worth to you, I suppose. If you’re running a business, for example, it might be that it’s a no-brainer and, actually, your time is worth a lot of money and, therefore, it’s well worth paying the money to get Audition. If you’re just doing it as a hobby, it might be that Audacity is absolutely fine; you don’t need the higher processing powers, all that type of stuff, and actually Audacity is just fine because it’s free as well. The last thing to mention, just before I finish up on Audition, is that it does use the better MP3 encoder as well. It’s the Fraunhofer MP3 Encoder, so it is better quality than the Audacity one, so you don’t have to worry about exporting from Audition to put into iTunes, you can just do it straight from Audition, so that’s a nice little time-saver as well. Now, just to mention on Audition, a friend of mine, Mike Russell, runs a website called audioproductionmasters.com, where he provides a whole ton of Audition tutorials. There’s a lot of tutorials out there, but his videos are really good for using Audition, so I’d really encourage you to go over and check out audioproductionmasters.com. And he does a podcast on audio production as well, which, often, is all about Audition, because he’s a bit of an Audition fan-boy. He’s well into Audition and he’s one of the reasons why I’m actually swapping over to do a bit of this stuff; a bit of my editing in Audition these days because he’s convinced me that it’s worth the effort to swap over. So if you want to know a bit more about Audition, check out Mike’s site over there. But that’ll do it for today’s episode on digital audio workstations. I hope that gives you a good idea of what to choose and the reasons to choose each of them. By all means, if you have any more questions on that stuff stick them in the comments. Just go to thepodcasthost.com/podcraft/205 and you’ll find the comments at the bottom of the page, past the show notes and the transcription. So get on there, ask me some questions, give me some feedback, let me know what you use to edit your podcasts. And it would be great to hear about your processes, too: what is it that you do to your audio every single time? Tell me what you do. Do you compress? Do you equalise? Do you amplify? Do you normalise? All that kind of stuff. Tell me what you do on your podcast, I’d love to hear about it. So just to finish up, folks. Thanks against for listening to another episode of Podcraft. This time around, I’m going to encourage you and plead to you to give me a review. I haven’t had a couple of reviews in iTunes for a little while, so it would be great to get some reviews on iTunes. Please do pop over to iTunes, find my podcast in there – just search for Podcraft in iTunes, you’ll find the podcast there and you can give it a review and just, well, whatever stars you think it’s worth. I would hope you will put in a little five star review, that would be absolutely brilliantly appreciated, but any kind of review at all will be excellent. It really helps to get the word out to the world about this podcast. So that’s all I’ll say for this time around and next time I’ll continue on with series two on audio podcasting equipment. So, thanks again and talk to you next time. Hi Colin. Another great show as I’m currently looking into moving from GarageBand which we’ve used for 8 years to Audition. Some of the things you mentioned about GarageBand aren’t quite right. There are quite powerful audio filters, effects, settings etc. which can be accessed through the info panel at any time. While they can’t be applied to individual regions, my process is to duplicate the track with the same settings, then chop out the bit I need to apply a filter to and drag it down onto the next track where I can apply filters and effects to that track. Also, GarageBand offers aiff, aac and mp3 export with a range of settings which can be applied. Hope that helps. Keep up the good work! Mark, thanks so much for the feedback! It’s great to get clarifications straight from someone who uses Garageband on a regular basis, unlike my second-hand accounts. That sounds like a really useful workaround for applying effects to particular regions of the track – I hope it helps out some of my listeners here.